Copyright 2012 American Association of Critical-Care Nurses. Background Intravascular devices provide essential vascular access for management of critically ill patients but can be associated with bloodstream infections. Objectives To determine colonization rates in segments of concurrently placed peripheral arterial, nontunnelled short-term central venous catheters and peripherally inserted central catheters and the pattern of heaviest colonization when the catheters are removed. Methods A prospective study was conducted on inpatients with intravascular devices in place for 9 days or more. At removal, each catheter was cut into 3 segments, and each segment was cultured separately. The density of colonization on external and internal surfaces of each segment was compared by estimating odds ratios by repeated-measures ordinal logistic regression. Results A total of 48 peripheral arterial, 135 central venous, and 106 peripherally inserted central catheters were obtained from 289 patients. Colonization was greatest at the proximal external segment of all catheters. On the external surface, colonization was lower on the middle (odds ratio, 0.70; P< .001) and distal (odds ratio, 0.56; P < .001) segments than on the proximal segments. On the internal surface, colonization was lower on the proximal (odds ratio, 0.39; P < .001), middle (odds ratio, 0.30; P < .001), and distal (odds ratio, 0.31; P < .001) segments than on the external proximal segments. This trend was similar for all catheter types. 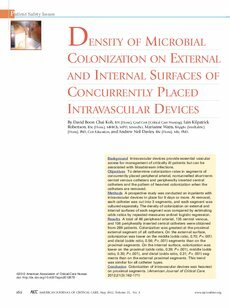 Conclusion Colonization of intravascular devices was heaviest on proximal segments. © 2012 American Association of Critical-Care Nurses.